Thankfully, Week 9 saw very little injuries. Unfortunately, that leaves a rather boring waiver wire besides a few players who had career days. Here are a group of players worth taking a look at for Week 9. Alex Collins has been underestimated, both in the NFL and in fantasy football. Last week against Miami he ran 18 times for 113 yards and added 2 catches for 30 yards. Collins has been a bright spot in the otherwise lackluster Baltimore offense. He is currently averaging almost 6 yards per carry, and has seen his workload increase almost every week. At this point, Collins should be added in all leagues and will continue to get the first and second down work, while Buck Allen continues to be used in passing down situations. 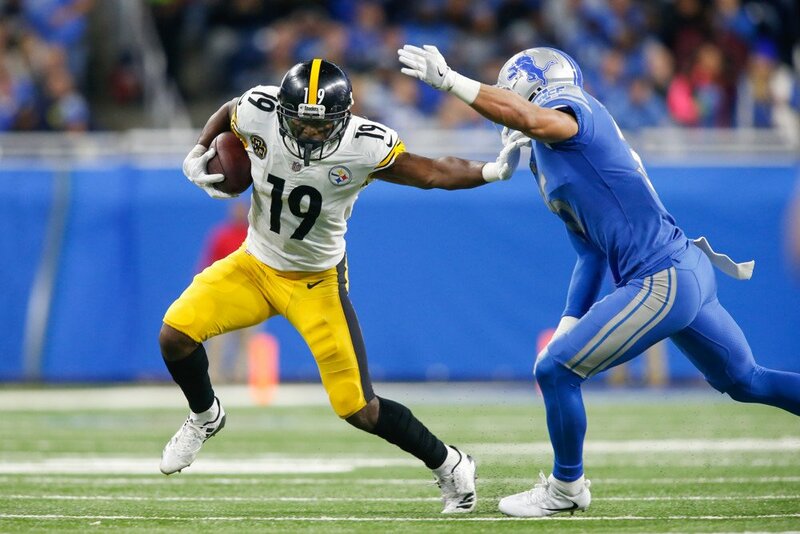 JuJu Smith-Schuster has been on the cusp of a big game, and he finally got that chance with Martavis Bryant sitting out. Well JuJu took full advantage of the situation, catching 7 passes for 193 yards and 1 touchdown (a 97 yard bomb). Big Ben looked to him often, and JuJu proved he could handle a larger target share (10 this week). It's hard to say how he will perform if Bryant returns to the team, but Smith-Schuster definitely showed Bryant isn't needed in this offense. JuJu should be added in 12 team leagues, but temper expectations if Bryant comes back. JuJu was averaging around 4 targets when Bryant played. Who would have guessed the New York Jets would have a decent passing game? Well it's true, and Robby Anderson is a big part of that success. In Week 8 against Atlanta, Anderson caught 6 of 6 targets for 104 yards and 1 touchdown. Anderson has been averaging around 6 targets a game, and seems to either boom or bust with that volume. The Jets have a rather easy second half schedule, with games against Tampa Bay, Kansas City, New Orleans, and NE.all teams who have had awful pass defense. Anderson can be added in 14 team leagues, and should be looked at in 12 team leagues for WR needy teams. Corey Davis has a good shot at returning in Week 9 after resting his injured hamstring over the Bye week. Davis looked electric in the first game he played, catching 6 passes on 10 targets for 69 yards. That's pretty impressive for a rookie WR on his first NFL game. Davis is more of a hype right now, since he has now missed 6 weeks' worth of building chemistry with Marcus Mariota. Still, he is the type of player that could lead to a fantasy title if he is targeted heavily once again. Davis should be added in 12 team leagues, but be aware that he faces Baltimore, Cincinnati, and Pittsburg in his first three games back. Since returning from a concussion, Jack Doyle has been targeted 32 times in 3 games. In Week 8, he was targeted 14 times, and caught 12 of them for 121 yards and 1 touchdown. This type of volume for a TE is rather unheard of unless your name is Gronkowski or Ertz right now, so Jack Doyle is a very attractive addition. He is a great streaming option to get you through the Bye week, but could very easily be your TE rest of season with this volume. He should be added in 12 team leagues. Tyler Lockett had his first big game of the season in Week 8, catching 6 of 8 targets for 121 yards. Since the Bye in Week 6, Lockett has been targeted 15 times. It's well known in the fantasy football world that Seattle often comes out of their Bye week hot, and it's already evident in the first two weeks. With the offense starting to click and Russell Wilson starting to play extremely well, Lockett should be the beneficiary of Seattle's amazing 2nd half play. He should be added in 14 team leagues, and can be looked at in 12 team leagues. Seattle has a decently easy rest of season schedule as well. Vernon Davis has had solid games when Jordan Reed was out, which happens often, and will once again be the go to TE with Reed exiting Week 8 with a pulled hamstring. Davis was a bit disappointing in Week 8 after Reed left, catching 2 passes for 20 yards. If Reed does miss any time, Davis becomes an intriguing streaming option against Seattle and Minnesota, two teams that struggle to cover the tight end.